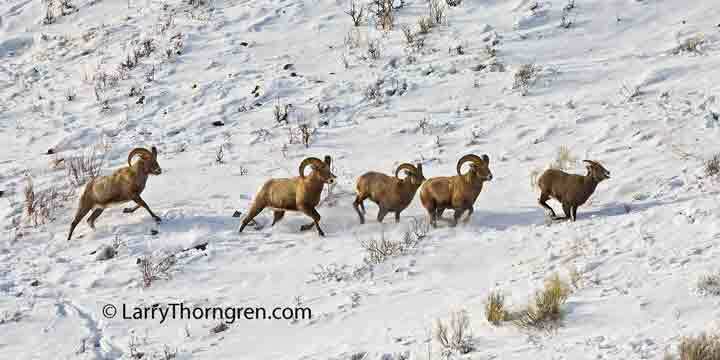 Young Bighorn rams pursue a young bighorn ewe during the winter rut. It is not unusual to see as many as ten rams pursuing one ewe when they have determined that she is ready to mate. In an un-hunted population, there would be some large mature rams in this group. The large rams would try to keep the young rams from mating and would be mostly successful. This herd of Bighorns has no very large rams because of over hunting. Hunters consistently kill the largest rams and only the smaller rams are left to do the mating. Hunters pay high fees for a permit to kill a large ram and the Wyoming Game and Fish Department allows too many permits because of all the money they can make from this practice.